This reasonable though seemingly paradoxical question is simply the wrong question. It is a consequence of having imagined the wrong thing. My goal here is to set your thinking straight. Let’s go back and look at Figure 3 from the Worlds of 1 Spatial Dimension article, the relevant part of which is shown at the top of Figure 1 below. 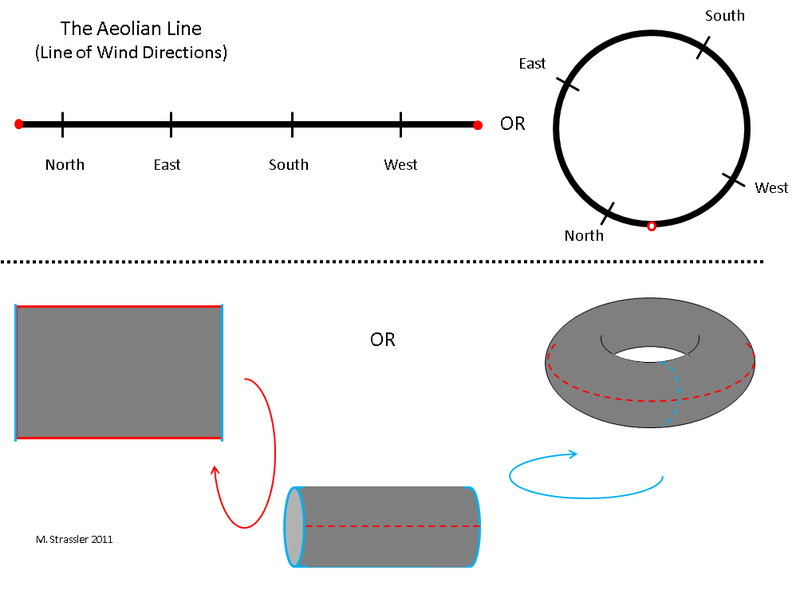 Notice there are two very different representations of the aeolian line (the dimension of possible wind-directions, which include the directions north, south-east, west-north-west, etc.) One representation is as a line segment whose left end is the same as its right end. The other is as a loop drawn in a plane. Now wait a second, you might ask. These look different. The loop surrounds an area, so it has an inside and an outside. The line segment doesn’t seem to have this. So how can these represent the same thing? Fig. 1: (Top) A circle can be represented as a line segment with its two ends the same point (marked in red) or by a loop drawn in a plane (where the open red dot is the same point as the red dots on the segment.) From the line segment representation it is easy to see that a circle has no inside and no outside. (Bottom) A torus can be represented as a rectangle with its upper and lower edges the same (marked in red) and its left and right edges the same (marked in blue.) The torus can also be represented as the surface of a tire, or doughnut. To see these two representations are the same, join the top and bottom to form a cylinder, then the two ends to form the tire. Though the tire appears to have an interior, the rectangle representation makes clear that a torus does not intrinsically have an inside or an outside. The joining seams are shown as dotted lines. Ah! This is indeed a crucial question, and the answer is vital to understanding spaces. The two representations — the loop, and the line-segment with its two ends matched — do represent the same one-dimensional aeolian line. The area that the loop surrounds is a property of the representation that we have chosen, not a property of the aeolian line itself! We must never confuse properties of pictures that we use in visualizing a space with properties of the space itself!!! That is very easy to do, but it is crucial not to do it. 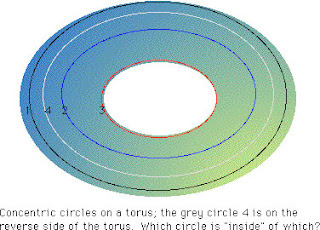 As another example, it looks as though the doughnut (torus) drawn in Figure 1 has an inside and an outside. But it doesn’t. Just as a circle can be represented as a line segment with the left end and right end being the same point, a torus can be represented as a rectangle whose top and bottom edges are the same and whose left and right edges are the same. (To see that this is true, take a piece of paper. Attach the top edge to the bottom edge. You will now have a cylinder. Now you have to use your imagination to bend the left and right ends of the cylinder around so that they touch: but you will quickly see this will give you a torus.) There’s no inside or outside for our rectangle with matched edges, so there’s no inside or outside for a cylinder or for a torus. In other words, what is essential about a space is what you would learn about it if you traveled within it. To see the circle has an outside or an inside, you would have to travel across it: but if your circle is the aeolian line, that’s impossible. You cannot ask the wind to cut across the circle from north to south-east! It can only go around the circle, via east or via west and south. The only thing intrinsic to the aeolian line is the line itself! And similarly, you cannot ask the tight-rope walker, from Figure 6 of the Worlds of 1 Spatial Dimension article, to cross from one side of the circular high-wire to the other. The only safe motion for the walker is to go around the circle one way or the other. So there is no way for the wind, or the walker, to find out whether there is or isn’t an interior or exterior to the circle. This conceptual point is actually really important in understanding the expanding universe. If you are like most people, you’ve probably wondered (as I did when I was young), “What is it expanding into?” Well, in asking this question you are making the same mistake as for the circle: you are confusing something expanding with a representationof something expanding. Fig. 2: Fig. 2: We are used to thinking about an inflating balloon expanding within three-dimensional space. It seems to have an interior and an exterior. But this just is a representation of an expanding sphere. An ant on the sphere could just as well represent it as a disk whose outer edge is a single point (as in a map of the globe with the north pole at center and the south pole at the edge.) It is then clear that it has no inside or outside, and does not expand "into" anything. It just expands, period, and this is evident to the ant from the fact that the distance between any two locations (such as the yellow and blue points shown) increases. For example, you might imagine an expanding balloon. A balloon looks to us as though it is growing into the larger three-dimensional space in which it sits. But if you were an ant on the balloon, you would not know anything about some rumored interior or exterior; all you would know is that the space on which you can walk has become larger. 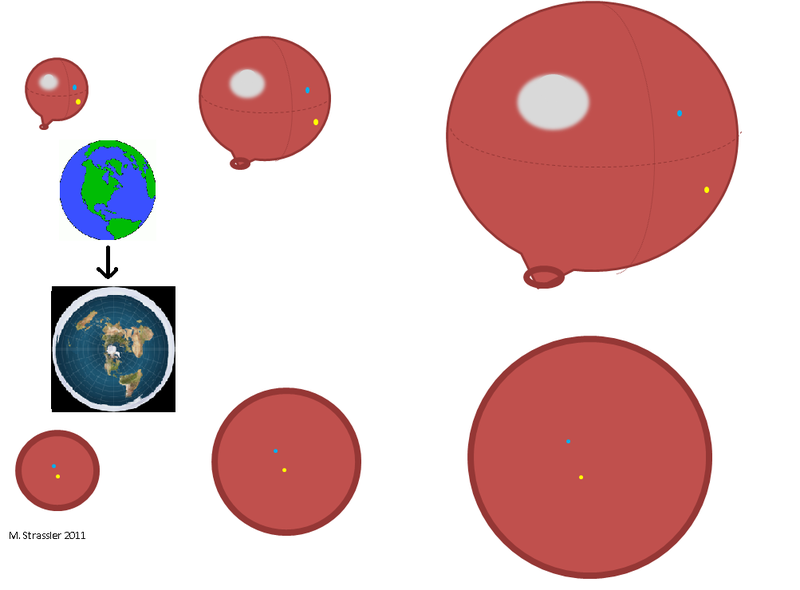 In fact you might (as an ant cartographer) represent the space as a disk whose edge is all one point (for instance, the point where the balloon is being inflated). You wouldn’t think about inside and outside; all you’d know is that the distance between the yellow and blue points (and indeed between all pairs of points on the balloon) is growing. Another two-dimensional space is the surface of the earth itself. Suppose you woke up one morning and the earth’s surface had doubled in size. You wouldn’t know whether the earth looked different to an observer out in space, or whether the diameter of the earth had grown. All you’d know is that when you walked to work or drove to get groceries it would take longer than it used to. That the interior or exterior of the balloon is a property of the representation of an expanding space, and not of the space itself, is more obvious in the case of an infinite plane. It is possible for an infinite plane to expand, though it is not expanding into anything. 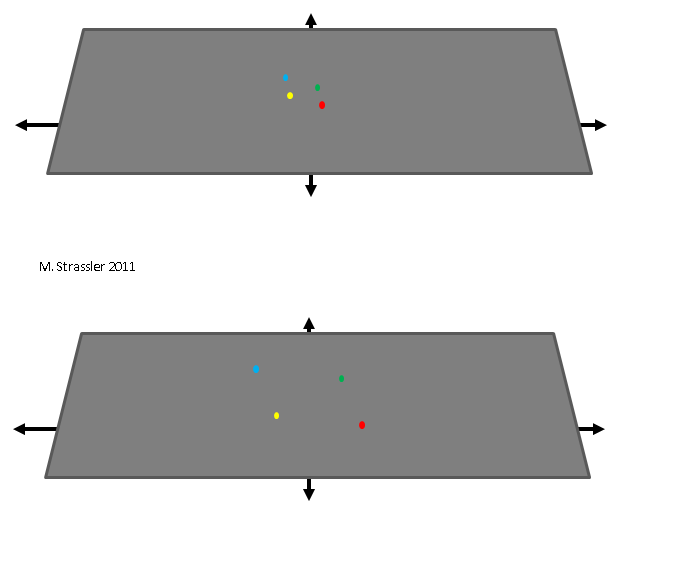 It fills exactly the same space after it expands as before; but the distances between objects on the space (for instance, the dots shown in the figure) has grown. The plane is intrinsically growing in size; it isn’t inside a larger space, and so it obviously does not — cannot meaningfully — expand into that larger space. It just expands, period. Fig. 3: An infinite plane can expand. It doesn't expand into anything; but the distance between any two points, including between any pair of colored points drawn above, grows as the plane expands. So it is with the universe. Like the plane just described, the space of the universe simply expands. There’s no way to see this from the outside; there is no outside. But you can tell the universe is expanding from within the plane itself: the distance between all of the big objects in the universe (in particular, between the galaxies, the universe’s great cities of stars) grows and grows as the universe expands. Over time, it takes longer and longer to go from one big galaxy to the next. That’s what the Big Bang did: it took small regions of space and made them huge. It wasn’t an explosion; it’s not like a bomb going off. It’s an expansion of space itself. Finding and understanding a inside\outside has been very difficult. Seen an example as a cookie being baked and with chocolate chips ……the distances between these chips are expanding…..as the universe. Okay then, Dark matter or dark energy? There is then an abstract notion about the distances? Greene may of call this a liminocentric view in the relationship of ourselves with the world? It is the difficulty of explaining our views in relation to what is to come in looking at the sphere? Hard concept to grasp professor. So if the universe is not expanding “into” anything how come in the pass we were expecting it to “bounce back” from “somewhere”? The “bounceback” refers to a time when expansion stops and contraction starts. This may or may not happen. Presumably, the distance between the particles (speaking loosely here) making up the person or instrument measuring this distance also increases in this scenario? But if that is the case, how would any measured distances change? If I am the one measuring distances for example, and the spaces between my atoms increases by the same proportion as those in the space I’m observing (since, after all, the colored dots in your diagram include those making up my body), then my legs and hence my steps would also be bigger, making it hard to see how I would notice the change. If I get a bit more savvy and try to use a pulse of light to measure the distances, then doesn’t the distance between successive crests or troughs of the EM wave also increase, just like my step sizes, compensating for the expansion in the underlying space? Good question. The point is that space is expanding relative to the size of a person or instrument. What sets the size of a person or instrument? Well, really what it is important to all ordinary objects is the size of an atom. An atom is an object built by trapping electrons (using electromagnetic forces) around an atomic nucleus. The size of an atom is set by the mass of the electron, the strength of the electromagnetic force, Planck’s constant and the speed of light. None of these is changing while the universe is expanding — so as the space within the universe expands, atoms do not. Similarly, hydrogen molecules, proteins, DNA, crystals — all of these have sizes that are set by the masses of the objects that make them up and the strengths of the forces that hold them together. The expansion of the universe effectively tries to drive everything apart — and everything that is not attached to something else will find itself further apart from everything else that it is not attached to. But once attachments occur — strong-nuclear ones that hold atomic nuclei together, electromagnetic ones that hold atoms and molecules and instruments and humans together, and also gravitational ones that bind stars and gas together into galaxies — the expanding universe is not able to break those attachments. And that is why there are objects of a fixed and definite size inside a universe that on average is expanding uniformly. Would it be possible to come up with a set of changes to the masses of particles, the speed of light and other constants that would be indistinguishable from an expanding universe? Matter getting smaller rather than space getting bigger. I expect that there’s a flaw somewhere but I’d be interested in your thoughts. You can actually do that if you want. You can rewrite all the equations so that instead of space expanding and other things remaining the same size, everything else is shrinking and space is staying put. But you haven’t changed the results of human experiments, which will be shrinking along with everything else. So we have two entirely equivalent descriptions of the world, one with an expanding universe and one with shrinking protons, atoms, stars, planets, and changing masses for all the particles — and it is up to you to choose the one you prefer. Here’s where Occam’s razor makes an appearance. There is no harm, and much benefit, in choosing the simpler one, so apply Occam’s razor and select the version of events with an expanding universe… remembering, always, that this was a choice. We can also put the earth at the center of the solar system, if we are willing to make all our equations for the laws of nature much more complicated; but Occam recommends “no”. The existence of multiple equivalent descriptions of the world is something scientists are quite used to. I stress the word “equivalent”; no experiment could distinguish them. There is much arbitrariness in our scientific choices. But it is fine to be arbitrary, as long as you remember what your choices were and why you made them. Sometimes Occam guides our choices; sometimes there are two comparably simple descriptions of a phenomenon, and then Occam doesn’t vote. In fact scientists often keep multiple descriptions around, since one may be useful in one context and another in a different context. But for the universe, it is pretty clear that it is simpler to think of space expanding and atoms and protons as of fixed size. P.S. Further to my question above, when people talk about this expansion, in relation to the big bang, are they talking about the expansion of *space* or are they talking about the expansion of *spacetime*? If it refers to space, then I’ve never understood how they separate out a particular choice of space from the assumed spacetime of general relativity. If it refers to spacetime, then the diagrams above are even more misleading to our intuition because the geometry is totally different than the one our brain is using to process these pictures. If an infinite plane can expand does that not define it as less than infinite to begin with? No. Infinity can expand, even though it is infinite before it expands and infinite afterward. Take the numbers 1,2,3,4,5,…. going on to infinity. Double them: 2,4,6,8,10,… going on to infinity. I can now insert new integers between them: 1,3,5,7,9,… In other words, by doubling the integers (an infinite set) I have found room for new integers that wasn’t there before. Conversely, nothing finite can expand to become infinite. Take any set of integers: 1,2,3,4…, 1000. Double them, and insert integers between. Now you have a larger set of integers: 1,2,3,4…,2000. But no matter how many times you do this, you will still have a finite set of integers. My mental picture of the universe is of an infinite volume that is everywhere peppered with galaxies in pretty much the same way that our surrounding few billion light years are. Is that the right model, or are all bets off beyond the observable horizon? Assuming it is thought to be the right model, I have talked to (and even corrected) people who instead imagined a finite ball of galaxies expanding into otherwise empty space. But is it actually known that that model is wrong? You can certainly imagine an expanding ball of galaxies a few hundred billion light years across, with our observable universe as a little ball buried somewhere deep inside. To us, that would look more or less the same as the infinitely-many-galaxies model. Are there non-Occam grounds to reject the second model? I suppose if it the second model were true it ought to generate an anisotropy in the CMB, but what if the giant ball were big enough we couldn’t detect it? There might also be strong theoretical grounds to reject such a wildly inhomogeneous early universe. Are there? In the same vein, some of the lay explanations for the anthropic-principle arguments for how we ended up with physical constants that permit life seem to suggest that these “other universes” are actually just really large scale inhomogeneities in a single infinite space time continuum. Do I understand that right? Or do you know? I do realize you’re not a cosmologist. Mark, your mental picture is certainly closer to correct than the “finite ball of galaxies in empty space” picture, which is quite wrong. However, once we go outside the observable part of the universe into the regions beyond, your guess is as good as mine. The theory of inflation predicts that some part of the universe beyond what we can see will be similar to the part we can see, but the size of that part isn’t predicted, and anyway inflation theory is not well-enough tested for us to rely upon it yet. We certainly have no idea what happens at the edge of that region, and we see no signs of any edge in the part of the universe that we can observe. Many variants of inflation predict the universe on the larger scales (far beyond what we can see) is a very complicated place and that most of it (but define “most”! that will occupy you for a while) is probably very different from the part that we can see. If in fact the universe is huge beyond imagining and very inhomogeneous, arguments using an “anthropic-principle” (or better, a “selection-principle”) do say that just as we live on a rock in a universe that is mostly not rock, we may live in a rather unusual part of the universe because, hey, that’s the only place we can live. So the answer to your last paragraph is “yes, you understand that right”. One very, very big universe, with lots of different regions, only a few of which are habitable. I’ve read a little bit about the the inflation model, but I have a hard time understanding how the model can be thoroughly tested. Since we are “stuck” in our observable universe, it seems difficult to gather enough evidence for or against various inflationary models. I imagine this is similar to our galaxy many billions of years in the future – at a time when space is expanding so fast that no other galaxies are observable. Inhabitants of that time period would look out into space and incorrectly assume that our galaxy is the entire universe, and that the universe is static and infinite. Perhaps I just do not have enough technical knowledge to understand the ramifications of inflation that can be verified by experiment. It’s not obvious how this is done. It’s quite a sophisticated subject! Certainly here are limits to what one can test, clearly, for the reasons you stated; you can’t actually see what’s outside our horizon. However, it turns out that inflation makes a prediction that quantum fluctuations in the field that drives inflation (called the “inflaton field” — this is the field that provides the temporary “dark energy” or more accurately “cosmological energy density” that causes the inflation) lead directly to the density of the universe not exactly constant, and those regions of slightly larger density collapse and form the galaxies and clusters of galaxies we see today. The details of inflation, as the inflationary period comes to a close, determine precisely what are the average size of and distribution of those slightly more or less dense regions. A lot of details about these regions of higher and lower density can be determined by very precise measurements of the leftover heat from the Big Bang (the cosmic microwave background) and from other measurements that are sensitive to how dark matter and galaxies are distributed. These measurements can be used then to rule out various models of how inflation occurred in favor of others. Interesting, thanks for the reply. Sounds like I should read more of the summaries from WMAP. I understand that the measured anisotropy of the CMB was used to calculate the geometry of spacetime, but I did not realize it also was used to check predictions made by the inflation model(s). By coincidence, I was recently having a discussion/argument with someone who was using “The God of the Gaps” to explain the matter/antimatter asymmetry of the Hadron Epoch. He had heard (probably on the internet), that “the laws of physics were suspended a millisecond after the Big Bang” and that resulted in all visible matter. The conclusion was that God must be responsible. I was trying to explain in a general sense why God of the Gaps does neither science nor religion any favors, quoting people ike Georges Lemaitre. However, I realized that I did not even know the leading hypotheses as to why the asymmetry may have happened, let alone how we might test our theories. One last comment… this dicussion and others I’ve had with non-science educated adults have made me realize something you and your colleague may find important. The average adult has no idea how cutting-edge physics theories are tested! They think it is like “philosophy,” by definition untestable, which places it on the same grounds as religion. This view is likely something perpetuated by the media and/or pop science. They know generally what a particle collider is, but they have absolutely no idea what it actually does and why that is significant! Nor do they know about the stunning science being done by spacecraft like WMAP, Planck, JWST (hopefully), etc. Going backward in time (reversing time) I see more clearly now that we can understand the universe untill its density becomes so high that our laws of physics break down but that the universe was (probably) already infinite at that point in time. Is that a correct view? The expanding balloon concept of the universe with the surface representing 3 dimensional space makes a lot of sense to me. The surface is infinite in so much as it is a seamless surface. One could travel along it’s surface forever. One could eventually come back to the starting spot unless there was a speed limit (c) equal to the rate of the expanding surface area. Could the ever increasing surface area represent entropy? Could it also be analogous that the 3 dimensional surface is expanding into a 4th dimension of time? I haven’t seen you reply to Derek’s question regarding whether it’s space or spacetime that’s expanding, but let me follow up on it. Similar to Derek’s reasoning, I’m assuming that it’s spacetime that expands. If that’s true, then can we actually determine that our space has expanded my measuring the time it takes to go somewhere, as in your example about detecting the hypothetical expansion of the earth’s surface but the increase in the time it takes to walk to work? If our time dimension has also expanded, wouldn’t the time sensors (our wristwatch or the neurons in whatever part of our brain lets us imagine the passing of time) also slow down, giving us the same perceived time interval for the walk to work? Sorry, occasionally I miss a comment. Space is expanding, not spacetime; to expand means to increase in size as time goes by, and that’s clearly not something that spacetime (which includes time and cannot, therefore, change over time) can do. To say that a space is expanding requires that you can look at the space at a given time and ask whether it is expanding or not. For most spacetimes, you cannot even ask this question. Only for those spacetimes for which there exist observers from whose point of view space more or less maintains its shape over time, only changing its size, can this question even be asked. It happens that the visible part of the universe satisfies this criterion to a good approximation. The spacetime of the universe as a whole, if we could ever learn about its parts that lie far beyond the part that we can see, may well not permit this question. I understand that the Universe is essentially spatially flat. But, growing up, this was far from a known fact, and curved geometries, both closed and open, were (and, to a lesser extent, still are) discussed. There is (at least 🙂 one point I was never clear on, however, in terms of curved universes. We live in a universe of 3 spatial dimensions (absent the extra dimensions of string theory). If the 3-D universe was curved (say, in a Riemannian fashion that made it a closed universe), is that curvature *within* the 3-D space, or does that curvature imply that there is a 4th dimension that the space is curved through (in much the same manner that a sphere is a 2-D surface curved through a 3rd dimension). If the latter, then I suppose the next natural question is how that 4th physical dimension would relate to string theory’s extra dimensions. Or is it the case that curvature within the 3-D space and curvature through a 4th dimension are somehow mathematically equivalent? One could, of course, ask the same questions about the curvature of space around a massive body due to gravitation. The key thing you need to learn is that you can tell that a sphere is curved WITHOUT LEAVING THE SPHERE. Two parallel lines will converge. You can go straight, keep walking and walking, and one day you’ll find you come back to where you started. It is not the case that a two dimensional sphere, in order to be a sphere, must be embedded in three dimensional space. Similarly, the universe’s three-dimensional shape might (though we have no evidence for this) be in the shape of a three-dimensional sphere. If it is, THERE IS NO NEED TO IMAGINE PUTTING THIS SPHERE INSIDE OF FOUR DIMENSIONS OF SPACE. You can have a three-dimensional sphere without putting it inside of anything. You just check the parallel lines. You see whether you can go all the way round. So no, we do not imagine that our three-dimensional universe, if curved, sits inside of a larger space with more dimensions. For the same reason, the expanding universe is not expanding INTO anything. It’s just getting bigger, and you can tell that without ever going “outside”; there is no outside to go to. If it is in the shape of a sphere, the statement that it is expanding just means that you will find it takes longer and longer before your walk brings you back to where you started. Thank you; I’ve *never* seen that fact mentioned before *anywhere*. I’ve read a number of books, pitched at levels from elementary to advanced, that talk about the open/closed/flat geometries, and none of them bother to mention this simple fact. Actually, they leave quite the opposite impression, with their “rubber sheet” illustrations of curved 2-D spaces. And hearing this, I am Gratified. I have seen it said elsewhere, but it is hard to say it clearly. I’m glad my way of phrasing it spoke to you. Quite by accident, I stumbled across what was undoubtedly stuck in the back of my mind about this. I was watching a bit of random Carl Sagan in “Cosmos” the other day, wherein he explicitly stated that the Universe may have the shape of a three-dimensional sphere curved through a fourth dimension of space. Don’t get me wrong; I quite take your point that the Universe is not expanding into anything; I’ve made that point a number of times to my own audiences. But I wonder whether the two cases (curved through a higher dimension vs. intrinsically curved) are mathematically distinguishable? When people talk about the universe being a three-dimensional sphere, they specifically imply there is no fourth dimension of space in which this sphere is embedded. The point is that you can tell the three-dimensional part of the universe is a sphere just by following parallel lines INSIDE the three dimensions and seeing how they diverge and converge and whether they return to a starting point. By contrast, you can tell the universe is embedded inside MORE space dimensions either by moving off the three-dimensions into the extra ones (which may or may not be practically feasible) or by sending something out into the extra dimensions — such as gravitational fields. The ability of gravitational fields to enter large and flat extra dimensions causes the gravitational force law to be diluted compared to the three-dimensional expectation. Since I was so informed by your statement that the Universe is NOT embedded in a fourth dimension, let me ask another simplistic question. The last two paragraphs of your article talk about an infinite plane; but I’m wondering if it is possible for the Universe to be flat (as it apparently is), *finite*, and unbounded. Actually, your article doesn’t mention boundedness, so I hope I’m not confused by the concept. My understanding is that the surface of a 2-D sphere is finite (obviously) but unbounded, while a 2-D hemisphere (for lack of a better example) is finite but bounded at the equator. There are definitely manifolds that are flat and unbounded. If you remember the video game Asteroids, where you could go off one edge of the screen and return from another, that was an example of a geometrically flat but unbounded universe. Topologically, that shape is a torus, and to embed it in 3-space it would have to have curvature, like you see with the boundary of a doughnut. But intrinsically it can definitely be flat. People have tried to see evidence in distant sky surveys that would indicate some more interesting topology like that — a guy named Jeff Weeks was one person suggesting that kind of research a while back. But I have the impression the smart money is on infinite-and-unbounded. And I’m not a cosmologist, just a former mathematician, so take what I say with that much of a grain of salt. “There are definitely manifolds that are flat and unbounded.” You left off explicit mention of whether a 3-D manifold could be flat, unbounded, and *finite*. Your example is 2-D, so I am left looking for a definitive statement on whether 3-D manifolds can have all 3 properties simultaneously. I’m also aware that a huge radius of curvature can cause the manifold to appear *locally* flat, so I’m also interested in distinguishing that case from a globally-flat case. Thanks for any insight you can provide. Well, the n-dimensional generalization of the “flat torus” is always flat, so there certainly is at least one flat, unbounded, finite manifold in every dimension. In the context of differential geometry and topology, unbounded finite manifolds are called “closed manifolds”. And I’m thinking these are the only examples, but I’ve really gotten rusty on this. But anyway, the answer is Yes: there is a 3-D manifold that has all three properties. Whether such a manifold is a plausible model for the universe “at any given time” is something a cosmologist, or at least a physicist, would have to answer. But I do think you would be really interested in the book The Shape of Space, by Jeffrey Weeks. When I read about the universe at the beginning of the Big Bang, it is often referred to as a single point that everything came from. Does that mean it was a purely zero-dimensional thing? If so, did the 3+ dimensions we live in somehow unfold from it? How does that happen? How can dimensions be created? Thanks for this article. It should have been the first on my list to read. Still I’m confused with words such as hyperspace, multiverse, parallel universes, and alternate realities. I understand to some basic extent the differences between ie., alternate reality and multiverse. So, if the universe is infinite in size is there an infinite number of particles and if you could break it down into say square miles is there an infinite number of square miles. Is your infinity meaning that if you came to what is the observable edge of the universe you would magically appear on the opposite edge, never going beyond or perhaps going around a circle since a straight line can be formed into any shape, forever? Do Physicists really like to deal with infinities, such as singularities at the bottom of black holes? Too many questions? Mark’s answer is basically correct. Let add something. The problem here isn’t too many questions, it is too few answers. We don’t know the answers to such big questions about the universe as “Why is there a universe?” or “What is the ultimate shape or size of the universe?” or “Is the universe really everything or is it a tiny part of an even larger thing?”, and it may be that the right question hasn’t even been asked or formulated yet. In physics we never actually come across infinity (since anything we can measure is finite) so all of this discussion is in our heads. The universe is under no obligation to behave in a way that makes sense to our heads, and especially not in a way that makes sense to our heads given our current knowledge. When people talk about the universe being infinite, they really do mean an infinite number of cubic miles and an infinite number of particles. The expression for a universe like you describe where you “wrap around” if you go far enough is “finite but unbounded”. That is, not infinite, since you can only get so far away from where you started, but also not having a boundary. The real universe could be either way, but right now I think people are suspecting it’s infinite. And, finally, infinities aren’t as bad as singularities. The real line is infinite and very well-behaved. On the other hand, the black hole singularity I think has more of a dividing-by-zero nature and is more troublesome. Sorry, but I’m age 70, grew up on a farm, I’ll use that as an excuse, so I’m a long ways from understanding, anyway, I understand this, that the observed universe is much larger than what is observable because of its continuous expansion over time, but what I can’t seem to understand is, seemingly, that even that may be just a small part of the whole, perhaps a fraction. When and how did the rest emerge? If you say quantum fluctuation, wouldn’t a fluctuation result in an entirely independent universe, perhaps as close to us as an atom, being that it was within the inflationary period, perhaps a multitude? Sorry one more. Surely that part lying beyond the observable universe, even if vastly larger, would still be in communication, so to speak, with the part that can be seen, wouldn’t it be similar? No excuse is necessary. We don’t know the answer to all of your questions. We do suspect that some of your questions actually don’t make sense… that they’re without answers. “How”, we have no idea. “When” doesn’t even obviously make sense. You cannot assume that time works in the intuitive way that we are used to when you start to talk about very distant and potentially very complex regions of the universe. I have a suspicion, however, that one thing that is probably confusing you (forgive me if I am mistaken) is that you may still be thinking of the Big Bang as an explosion that occurred starting from a single point. This is inaccurate (an inaccuracy that is promulgated on many website and popular programs, unfortunately) and it does lead to considerable confusion. The universe may always have been very large. And when you ask, what about at its beginning — I don’t know anything, nor does anyone else, about its true beginning. All we know is that for a while, long ago, our region was hot and dense, and that before that our region was probably “inflating” (cold and expanding very rapidly). We don’t know what happened to our region before that, and we don’t know anything about other regions. Combining Einstein’s theory of gravity with what we know about quantum mechanics suggests that even within a tiny region, a sufficiently remarkable quantum fluctuation can cause a new bubble of universe to grow. In short, a huge amount of new space-time can emerge from very little space-time. As you suggest, it would effectively be entirely independent in the sense that you could not hope to travel from the new bubble universe to the place it came from. But in another sense it would not be independent, because it would be governed by the same fundamental equations as the part of the universe it emerged from — though practically this might be impossible to establish, either in the parent universe or in the child universe. There is, therefore, a semantic point about whether this is or is not an “independent universe” of its own. No. During inflation, for instance, parts of the universe can recede from each other faster than light. [No, this does not violate relativity, which strictly speaking says only that two things that pass each other cannot pass each other faster than light; if they are far apart, the requirement is more subtle.] The effect of this can be to leave these parts unable to communicate, at least for a very long time. So inflation of our region of the universe has made it impossible to communicate even with distant parts of our own region, and certainly with other regions. And therefore there is no need for distant regions of the universe to have the same properties as our own. No, Mark you may jump in at any time. Vastly more complicated than I imagined, and yes I assumed the universe emerged from the same single point, most people, like me, had the idea of the universe as the one that is shown in the MBR, one single entity, well now I realize that it may be just a very small part of a much, much larger unknown universe. I however believe that at some point in time, in the destiny of Man, that faster than light travel, or more likely that the enclosed space around a space craft itself, given enough energy, will allow us to travel faster than light, than we may learn, at least those who are alive. Thanks for your reply. At the present rate of expansion in the far off future, a google google yrs. space will become, even if infinite, a very, very empty space, a space that contains little of what we can see of stars and galaxies, perhaps even the basic particles of nature being ripped apart, the great rip, darkness will rule, what remains then of the forces and fields of modern physics when they have nothing to govern and will space continue to expand? ignore if you wish the first, but where gravity’s causality is a depression in space itself by the mass of say the sun or other object around which the planets or other objects revolve, why are we looking for gravitons? Evidently gravity must be a type of field, and the picture of a depression in space itself not a correct one? By the way I saw your talk, it was very, very good, very understandable, now I understand a little more of what particle physics is about. When is your next one? To Matt Strassler: You said “You cannot ask the wind to cut across the circle from north to south-east! It can only go around the circle, via east or via west and south.” I guess you cannot cut across the circle from north to south-east but it seems “you CAN “jump” from north to south-east without going around the circle via east or via west and south”. So, you do not really need to go around the circle in this case and actually the wind direction “flips” from north to south-east via zero-wind (=in this instance, the wind direction cannot be found anywhere within the dimension?). or in other words, the north wind becomes zero and the another wind direction reappears at south-east? true or not? True, IF the wind becomes zero. In my analogy, I am presuming that the wind does NOT become zero, but keeps blowing. This is a limitation of my pedagogical strategy. So you are correct there is a subtlety here. But I hope the point is still clear: if the wind keeps blowing, it has to change direction continuously, and can’t jump in direction. To Dr Matt Strassler:(continued from my post above). On the contrary to wind direction within one-dimension, a tight-rope walker that goes around the circle CANNOT jump from a point within the dimension and reappear at another point at least “intuitively”. Is this the case? or does quantum field theory allows such a “jump” within a dimension? If so, why? and another question:how do can we determine if the universe is infinite or finite? If the universe is closed like a surface of a sphere then it must be “finite” even if it is ever expanding. ->correct or not? but how do we know if it is like a closed sphere? If you can come back to where you were by traveling straight, does it always mean the universe is finite? If so, what is the requirement for it to happen? Just a non-zero bent(curvature) of space-time? If the curvature of space-time is non-zero, can we say the universe is finite? if so, how can we determine the curvature of space-time is zero, or non-zero? Does the fact that the positive mass/energy exists around us mean the universe is finite? or the total positive and negative energy cancel out as a whole in the universe and thus the curvature is zero on average and this means our universe is “infinite” and also “expanding”? but if + and – energy cancel out, how can the universe expand? or the + energy is matter and – energy is the expansion(=expansion is created by – energy?)? and so it can expand forever while creating more matter as it expands? what is the consistent evidence/explanation according to the best current physics theory? Your intuition is right… quantum theory doesn’t allow jumps in the sense you’re asking. But let’s not go there… quantum theory is not something you should try to understand at the same time as trying to understand extra dimensions. First understand how extra dimensions work, then worry about how quantum physics deals with them. is it possible you could comment on this article by a christian astronomer on the big bang ? Of course the Big Bang could be proven wrong! Predictions of the details of the cosmic microwave background were made before the measurements were made, see for example http://background.uchicago.edu/ , and they could have been disastrously incorrect. Twenty years before that, the Big Bang could have given completely the wrong answer for the amount of hydrogen, helium, deuterium, lithium, etc. in the very early universe — but it did not. In many many ways, the Big Bang has been tested in a context where it might have been falsified — and it has not yet been falsified despite myriad attempts. Agreed. The Big Bang is no such theory; it is not a theory that can “explain anything and everything?. A trivial example: if there were more lithium than hydrogen in the early universe, it would not be able to explain that. Another: if the acoustic peaks in the microwave background were randomly distributed rather than roughly periodic, it would not be able to explain that. Anyone who characterizes the Big Bang in this way either doesn’t understand the science or has a non-scientific agenda. With respect to figure 3 the coloured dots, which presumably represent galaxies, are moving apart, the distance between them is increasing. Is it therefore the case, that each of the dots is moving in all directions at once? In other words if our galaxy is moving away from all other distant galaxies, then it is moving outward in all directions at once, while a few of the nearby galaxies are moving inward and coalescing. There should therefore be a presumably spherical area within which inward gravitational motion predominates over the expansion. The point I am trying to establish is whether our galaxy is in fact moving in all directions at once, i.e., away from all other distant galaxies in every direction, due to the expansion of space. If we try to represent such a galaxy in a Cartesian reference system, in which our galaxy is arbitrarily placed at the origin, our galaxy would be arbitrarily arrested and its outward motion falsely added to the outward motion of the distant galaxies. Thus it seems that we need a reference system in which the point of origin is not fixed but is constantly changing, such that what was at the origin, or 0 becomes 1-1-1 on the xyz axes after one unit of time. But in the Cartesian reference system, such a body would be in several locations simultaneously. Is there a reference system that can represent such motions correctly? A further clarification of my previous post: our galaxy is receding away from all other galaxies, hence it must appear redshifted to observers in the distant galaxies that appear redshifted to us. From this it follows, or so it appears to me, that the redshift we observe is a measure of mutual speed, of which only half is to be attributed to the recession any given galaxy away from us and half to our recession away from the mentioned galaxy. However this is occurring in all directions at once, so that our galaxy is in fact moving outward (away from all other galaxies) at the speed indicated by the redshift of the farthest galaxies. Given the fact that half the redshift of any given galaxy is in fact the consequence of our own galaxy’s motion away from that galaxy, by considering any pair of receding galaxies located in opposite directions, we need to add the corresponding half redshifts and conclude that our rate of recession is equal to 2 x 1/2 =1, where 1 is the redshift of the most distant galaxy observable. The problem comes when we try to place this situation in any sort of a familiar reference system. If we fix our our galaxy at the origin of a Cartesian reference system, we will necessarily get a distorted picture, as the distant galaxies will appear to be receding at twice their actual recession speed (by fixing ourselves as motionless observers, we are attributing all of our own motion to them). This seems to be an unavoidable consequence of the observed expansion, unless we take the position that we are in fact stationary at the center of the observed universe. Yet I have never read it spelled out quite in these terms. Based on the above considerations, we should be able to determine the speed of our galaxy’s recession. Am I on the right track? neew information on your blog. done a formidable job annd our entirre community will be thhankful to you. a much larger building to provide for meetings. a social clubhouse with free Wi – Fi and the required bar for divers. The same approach is used to explain why there is no center of expansion – “imagine you are on the surface of the baloon, and surface of the baloon is expanding and you being on the surface can’t tell where is the center of expansion…”. Wrong analogy. Our space is 3D as we know it (or even more dimensional). So if you use baloon analogy then your baloon should also be a 3D object, and each expanding 3D ballon naturally has center point. Because it expands outwards from some initial point. If you object using analogy of 3D space with 3D baloon then explain why do you object. Same troubles I have comprehending Einstein gravity demonstration as analogy with some net bulged down. And rolling ball move along the bulge. But in real world it is not bulged down. it is bulged in all directions and all angles and even to front of the moving object. The same flawed analogy is used for depicting black holes – a funnel directed downwards. But in reality that funnel is directed to inner center point thus it is not a funnel at all. Analogy is good when it is relevant and not misleading. Still, frankly, as a layman, I am suspisious that common explanation that speed of light is not violated by inflation because it is space expansion – I am suspicious it is kind of a trick to get rid of the major model flaw. … and I forgot to thank you for your really really incredible blog. So much interesting and educative. Why doesn’t the distance between the little objects grow? If everything is expanding then your ruler is expanding. The distance will never change.